"The church shooting was the tipping point," Flanagan wrote in a 23 page manifesto faxed to ABC, "but my anger has been building steadily…I've been a human powder keg for a while…just waiting to go BOOM!!!!" I have news for you, there is no difference between Flanagan and Dylan Roof except the color of their skin. Both posted their hate of another race on social media, wrote manifestos, and then went out and, in cold blood and without conscience, murdered people of the race they hated. Flanagan also expressed admiration for the gunmen who carried out mass shootings at Virginia Tech in 2007 and Columbine High School in 1999. I'm pretty sure all biased media will report are his feelings about lone murderer, Dylan Roof. 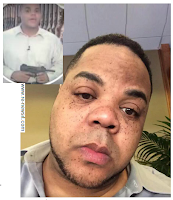 On August 26, 2015, around daybreak, Vester Lee Flanagan II, aka Bryce Williams, loaded up his gun and smart phone and did something I have never heard of before, he murdered two people in cold blood while filming the deed. At approximately 7:00 AM, while holding his cell phone in one hand and his weapon in the other, Flanagan walked up to reporters doing a remote, live news broadcast for WDBJ in Virginia, and shot reporter Alison Parker and cameraman Adam Ward to death. As Flanagan was fleeing the scene, he shot the interviewee, a City Councilwoman, in the back. She is in stable condition at the time of this writing. 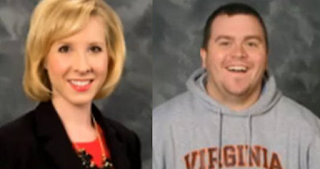 It turns out Flanagan, was a former employee of WDBJ. The general manager of that station, located in Roanoke, Virginia, said that Flanagan had a reputation as "being difficult to work with" and was fired because of anger problems in 2013. Flanagan reportedly shot himself while being chased by state police hours after the murder, where he later died. A coward who will never have to face charges - he should not have been able to choose his own time of death after robbing two beautiful people of that right. On social media Flanagan accused Allison Parker of using racial slurs against him. Flanagan had filed a lawsuit with EEOC after being fired but the suit was dismissed. Alison's boyfriend gave an interview to CBS today. Flanagan posted the video of his cowardly act to his social media accounts under the name, "Bryce Williams". Those accounts were removed almost immediately. 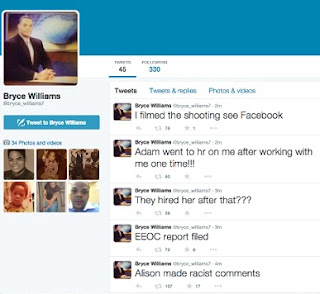 On his twitter account, @bryce_williams7, he wrote, "I filmed the shooting, see Facebook". He also noted, "Alison made racist comments". Vester Lee Flanagan was born October 8, 1973. According to his social media posts, he is a Jehova's Witness. WTOC - Savannah, Georgia late 1990s. Our prayers are with the families and friends of these victims. Breaking: George Zimmerman takes a Selfie! Shaun King meltdown - Narcissist much?